Sometimes it was easy to bring great reinforcements to the club because the scouts performed tasks quickly and successfully. Open the search filter. Enter the desired parameters and the solution is there. Today, the whole process is significantly more difficult. 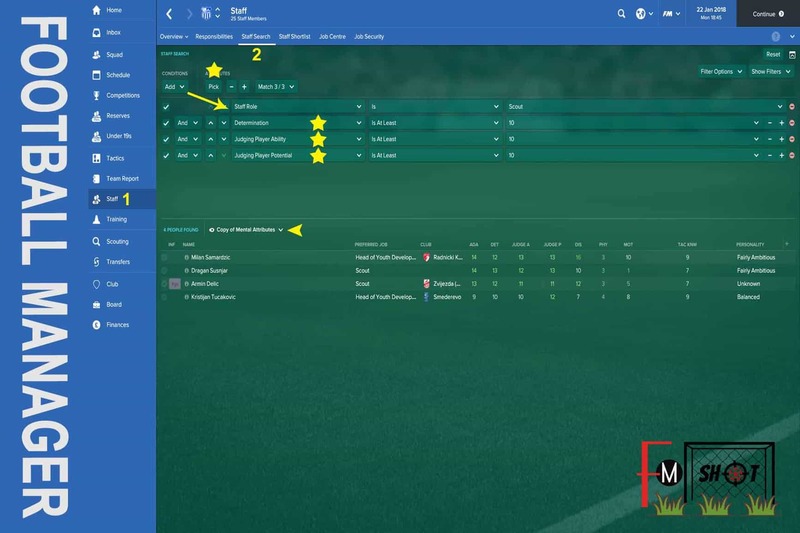 The main culprit is the novelty attribute masking that first appeared in FM 2016. 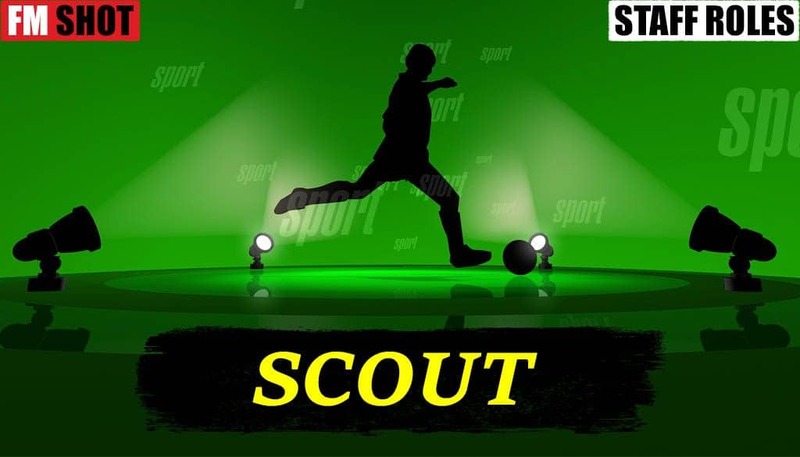 It is necessary between 2 weeks and a month of scouting, in order to get all the information about the player who is on our wish list. Therefore, it is important to have a good team of professionals where everyone can come to the fore. Someone can look for talents while another staff member reports on next opposition team’s strengths and weaknesses. It is up to us to assess their quality and focus toward a common goal. Good scouting is difficult to imagine without Judging Player Ability (JPA) and Judging Player Potential (JPP). If there is a grade 10+ next to them, the scout deserves my attention. Second in importance is Determination or as I like to say “dedication to the job”. Whether the task will be done quickly or not, largely depends on this attribute. 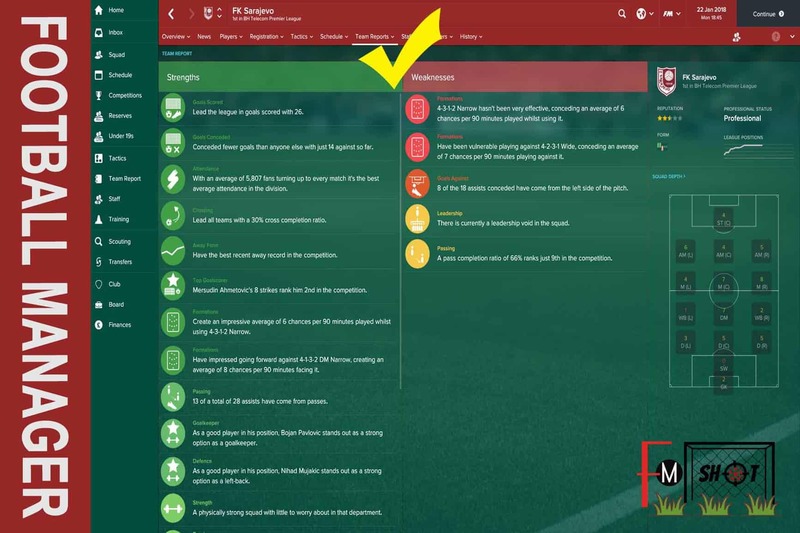 If we want a detailed report on the next opponent, scout must have a good Tactical Knowledge. It is necessary to pay attention to Working with Youngsters, where the primary goal is the search for young and talented players. A good start for a scout is some Under 19s competition. In the end, it remains Adaptability attribute which is very important for both foreign to domestic scouts. Why? Scouting certain nation takes time. There is a result or not. But the information received can quickly “melt” if this attribute is weak. 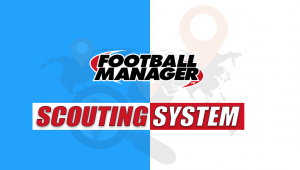 In other words, you will have to send scouts to a specific country multiple times to refresh Scouting Knowledge. A position reserved for the best of the best! In some ways, the chief is an association for the Man Management attribute. 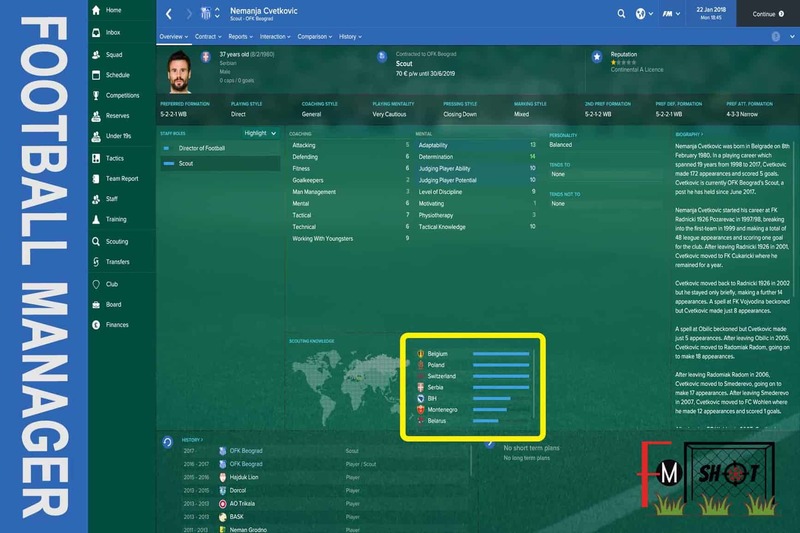 option to set the country/competitions for scouting. If you do not have the right solution for this position, let it remain empty. You will not make a mistake! 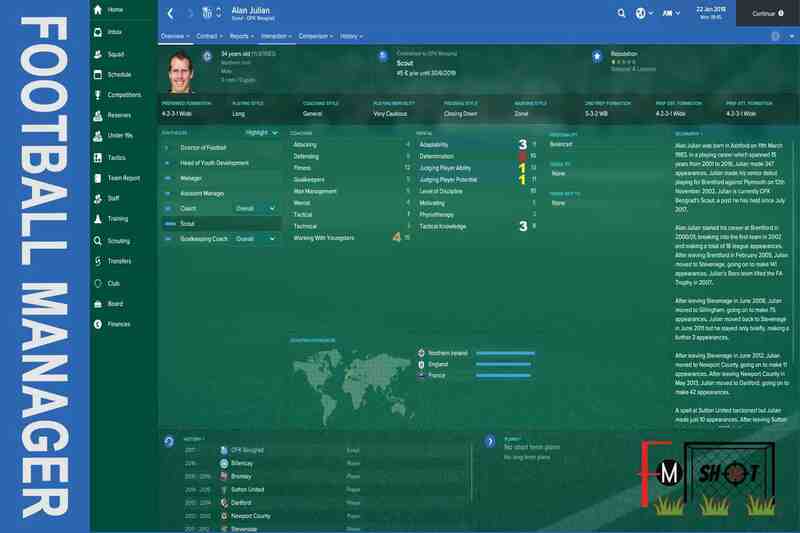 For example, the club I’m currently training (OFK Beograd) has no chief scout. If I were to find a right candidate, the first task would be a big competition and/or scouting the next opponent. 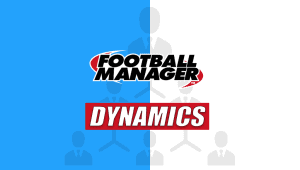 The easiest task is to type in google “Best Scouts in Football Manager” and download the list. A scout is not needed as you have all the information. But, if you choose the hard way and want to find yourself new reinforcements for the club, there are several options. – report from a (competition, nation, regions, on a team). This indicator is very important! I will explain why. 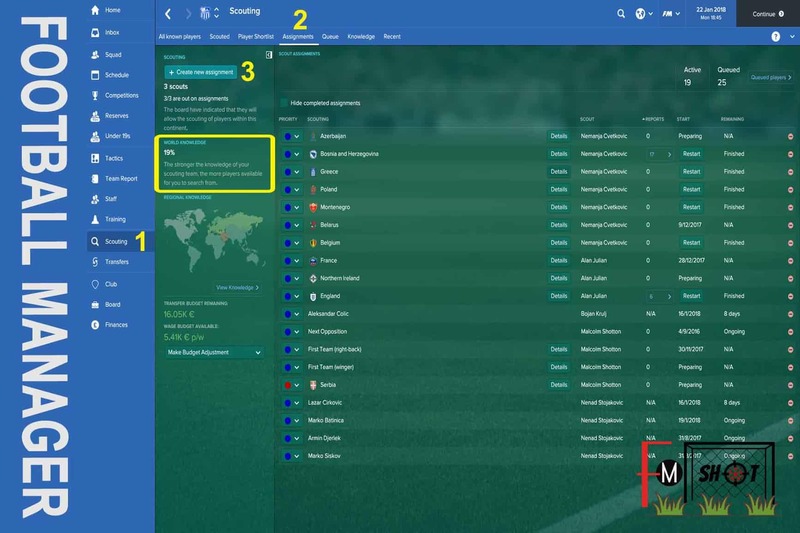 I played FM 14. After a long search, I decided to bring a scout who was not well known, but he has had excellent attributes. Immediately I determined the interesting destinations he has to visit. However, he did not justify my expectations. 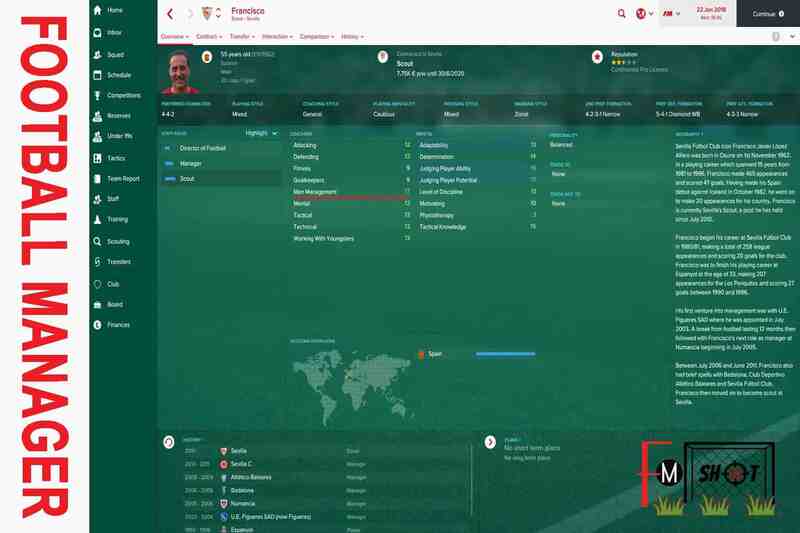 I fired him after 3 or 4 seasons spent at the club because the results were very bad. Then I realized that Scouting Knowledge should have a slight advantage over the scout attributes. I found several scouts who had excellent SK but something worse attributes. Their arrival doubled the World Knowledge in the club. So sometimes we have to look at the larger picture. Right now I have a scout in OFK Beograd that fits into this story. His favorite destinations are: Belgium, Poland, Switzerland, Serbia, Bosnia and Herzegovina, Montenegro, Greece and Belarus. How to make a search filter? It is necessary now to find a good scout for the club. At the moment I have 3 scouts in the club and there is a place for another one. 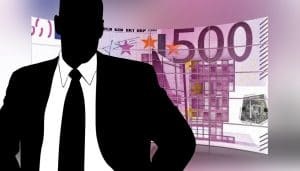 The wages are small (70 € p/w) so there will be no easy solutions. However, I will explain my search system. First I choose the staff role option. After that, there are 3 attributes (Det, JPA and JPP), which must have a rating of 10. If many candidates appear, then I make a narrow choice. Most often I add another attribute (ADA or WWY) or additional options: age and wage. Unfortunately, the candidates above do not meet my criteria. 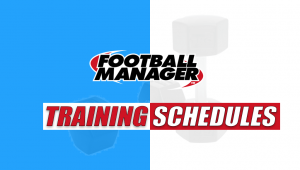 So there will be a small break until the World Knowledge of Club and finances increase. 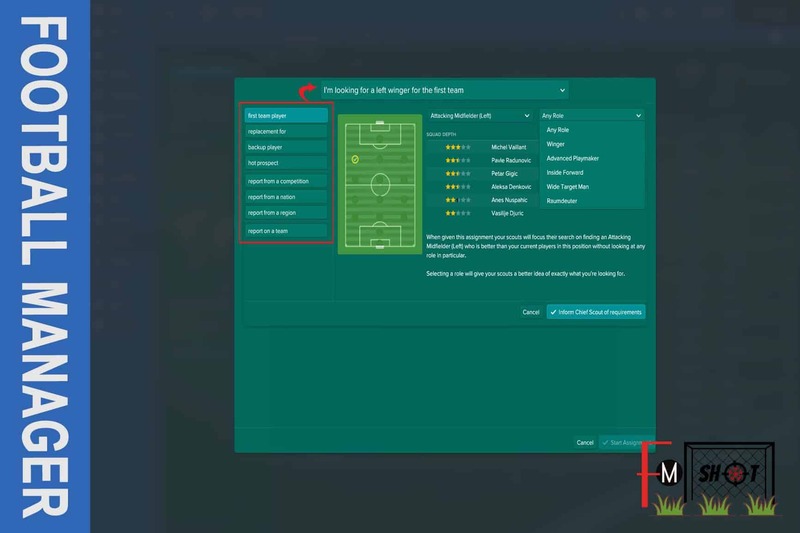 But in the end, here are my recommendations if you are looking for a good scout: Roberto Ayala, Tomasz Waldoch, Federico Balzareti and Pat Rice.